Above: Tjupi Band from Papunya, singing in Luritja, showed why they’re one of the desert’s most popular. 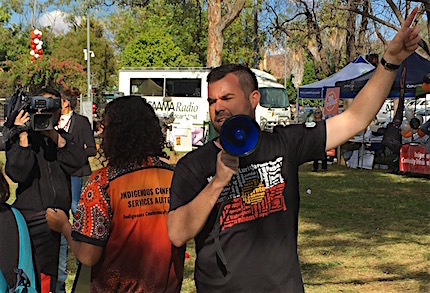 An upbeat Chansey Paech (left), MLA for Namatjira and a local Aboriginal man, had led the hundreds-strong NAIDOC march, down the mall from Anzac Oval to the council lawns and there was certainly nothing silent about it. As Mrs Turner had also stood in last night to do the Welcome at the civic reception in honour of the Governor-General, Sir Peter Cosgrove, he presented her with a Governor-General’s medallion for “civic mindedness above and beyond the call of duty”. She was certainly chuffed. Below: A triumphant Amelia Turner, medallion in hand, with from left, CAAMA CEO Karl Hampton, Lady Lynne Cosgrove, MC Johanna Campbell, and Sir Peter Cosgrove. The Governor-General went on to give the opening address, about the day “for all Australians to celebrate what it is and what it means to be an Indigenous Australian”. 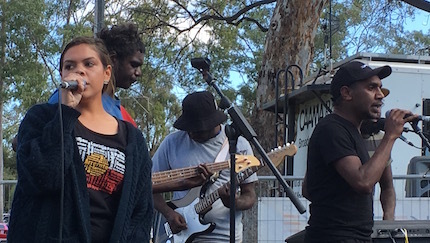 He spoke to the national NAIDOC theme “Our languages matter”, recognising that Indigenous languages express “connection to land, to history, to the sky and the law”, and are “an eternal bond to loved ones, to family and ancestors and country”. Left:Singer Crystal Butcher had a guest spot with Tjupi Band. 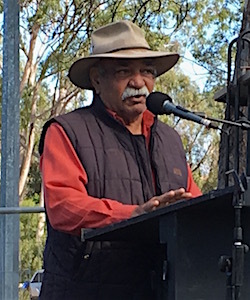 His speech set the stage nicely for Harold Furber to make what he described as a “last minute announcement”, in his capacity as chair of a group “leading a push for the national Indigenous art and cultural centre here in Alice Springs”. 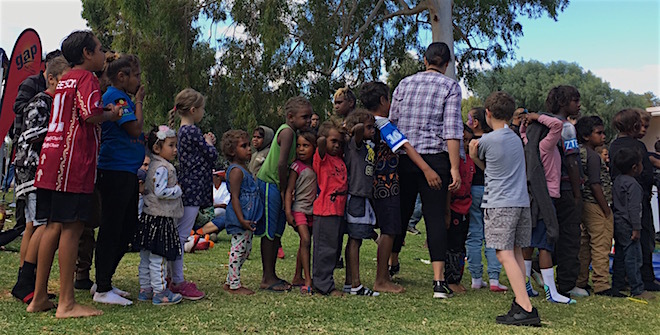 He said the group has been working for 10 years, and has received a lot of support, including “now from the Northern Territory Government”, which has provided funding for a project officer “to start organising the consultations for the entire project”. 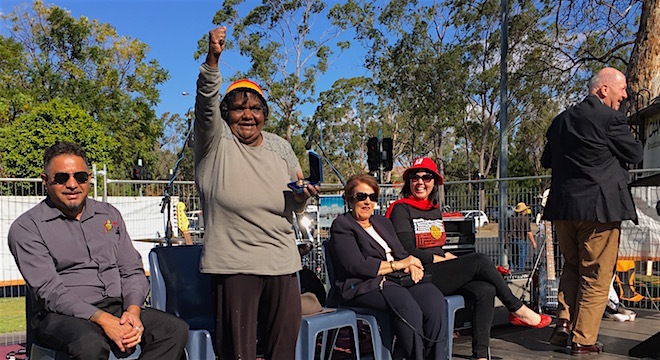 At this stage, he said, the project is worth about $70m (the amount promised by the NT Government) and it “should have a long term effect on the development of this town”. 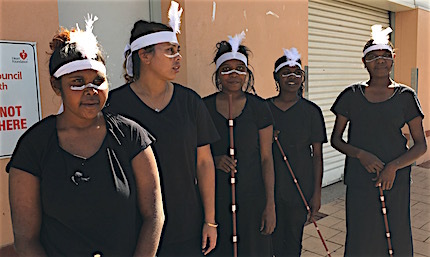 Left: Young Arrernte dancers wait for their turn centre stage. To date, the government has spoken of two separate projects, one described as the “Iconic National Indigenous Art Gallery” and the other as “Nganampa Anwernekenhe”, the former being led by a government-appointed committee, co-chaired by Hetti Perkins and Philip Watkins, the latter, led by Mr Furber’s group (the Nganampa Development Corporation). Does Mr Furber’s announcement today mean that his committee will start working with the Perkins-Watkins committee? It means “they’ll work with us”, Mr Furber told the Alice Springs News Online. “Our group has long term been working on a national art and culture centre. The Territory Government has gone sideways and set up another committee. Mr Furber (left) said his group expects to sit down with the government-appointed committee; in fact, they have already, at that committee’s first meeting: “We advised them of what we were doing, that we were surprised this was set up. “We advised them that this is an Aboriginal initiative. You can’t separate art from culture. We’re pursuing that line, continuing the international and national consultations we have undertaken over the last 10 years. Referring to the discussion about the project on last Monday’s Q&A and the impact that Hobart’s Museum of Old and New Art (MONA) has had on the whole Tasmanian economy , he said “we can develop the MONA effect” and “no-one needs to worry about the art they are selling, it will increase”. As Chansey Paech is the Assistant Minister on the Iconic National Indigenous Art Gallery, the News asked him to comment on Mr Furber’s announcement. Mr Paech said there is “definitely a lot of merit” in the two committees having a good conversation about whether the projects are “co-located or merged”. Below: Queuing for the Jumping Castle.